Imagine a converted ice-cream truck tricked out with civic storytelling gear. Imagine fold out couches, a multimedia recording studio and a pull-down platform all stuffed into one brightly colored van. Pop-Up Public will travel to neighborhoods throughout Sacramento County to record hyperlocal stories and present them back at community events and on CapRadio’s website and news programs. To make this happen, we’ll partner with community-based organizations anchored in neighborhoods to bring residents together to create media about their lives and worlds. We’re currently collaborating with community leaders to develop the project concept and methodology so that it’s effective, meaningful and relevant. Our shared goal: combine participatory media, journalism and public events to generate powerful local stories and build community. Terry Dugan (Rosemont Community Association), Dylan Seidner (Hollywood Park Neighborhood Association), Tamika L’Ecluse (Oak Park Neighborhood Association) and Elaine Hebert (Southside Park Neighborhood Association) share stories about the places they live during a Pop-Up Public meeting at Capital Public Radio. A StoryTruck creates driveway moments, literally, as we roll up to parks and parking lots engaging everyday people in storytelling activities. We’ll play stories we’ve gathered, record new ones, snap photos and post it all to our digital platform(s). We’ll help people of all stripes share their experiences via drawing exercises, mobile phones, iPad kiosks and our cozy recording studio. 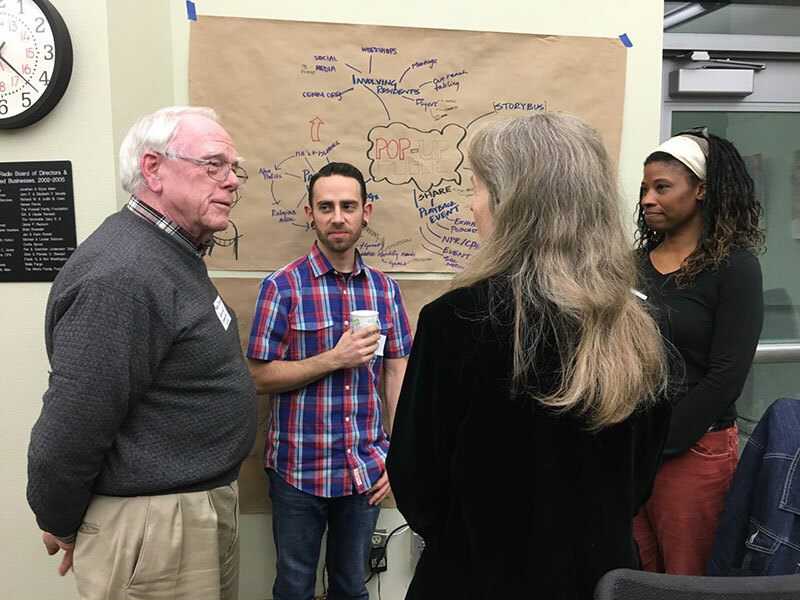 Civic socials bring together diverse community members to listen, learn, and respond. Food + music + storytelling + community dialogue = Pop Up Public. Events will be co-created with community partners to host activities that are energizing, culturally relevant and take care of business in the neighborhood. A gorgeous, interactive website filled with audio stories, photos, videos, text messages and drawings produced in collaboration with community participants tells the story of our region’s peoples and histories. 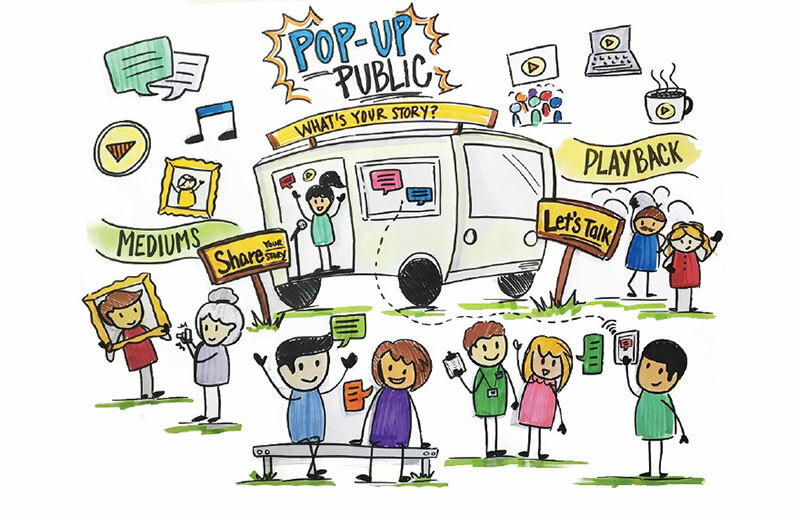 Pop-Up Public is CapRadio’s latest community engagement initiative. Community engagement is how we serve our community—to listen, to provide a space and tools to help tell stories and to create social impact. Pop-Up Public is in development! Check back for updates. Questions or suggestions? Contact project director jesikah maria ross. 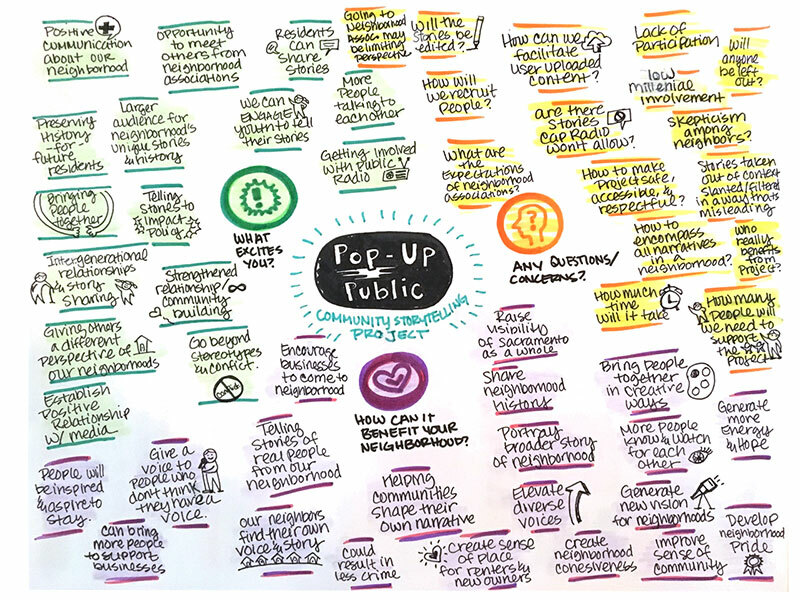 CapRadio asked neighborhood leaders to respond to the Pop-Up Public concept. Here is a compilation of their thoughts and feelings, which continues to guide project design.